Obituary – Anderson, Luada Jo (Brengle) « Perry High School Alumni Association, Inc.
Normal Training, Glee Club ’20, P.H.S.C.A. ’22, Peroma, T.M.S. Services will be at 3 p.m. Monday in the First Baptist church for Mrs. Luada Jo Anderson, 58, who died Friday in Perry Memorial hospital following an illness. Dr. O. L. Gibson, chaplain of Stillwater Municipal hospital, will officiate at last rites, assisted by Rev. H. E. Alsup, pastor of the Perry Baptist church. Burial will be in Grace Hill cemetery under direction of Parker funeral home. All Perry schools will be dismissed for the day at 2 p.m. Monday because of the services. Mrs. Anderson was born Aug. 13, 1905, in Springfield, Ky., and was married Aug. 9, 1936, in Stillwater, to Byard Anderson, who survives. She had made her home in Noble county since 1908. 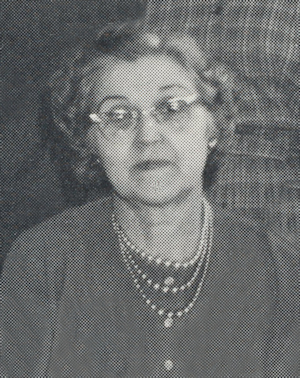 Mrs. Anderson graduated from Perry high school in 1923 and received her bachelor’s degree from Oklahoma State university in 1928. 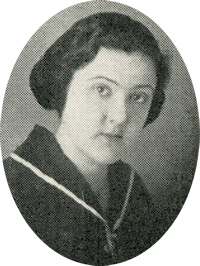 She also attended Oklahoma Baptist university, and the Southwest Baptist seminary at Fort Worth, Texas. She taught in the Perry grade school system several years, and for the past eight years had been secretary to her husband, the Perry junior high principal. In addition to her husband of the home at 909 Jackson street, survivors are a son, Gary, a student at Oklahoma State university; two sisters, Mrs. Bob Wilson and Mrs. Alan F. Wilson, both of Perry; and a brother, Walter C. Brengle, Ponca City. Active pallbearers will be John Gillaspy, Fred Johnson, Everett Chaffin, David Sherrard, George Miller and Juke Burkett. Honorary bearers will be J. B. Fox, John Divine, Howard Rainwater, Ashley Alexander jr., Harold Daniels, A. L. Ebersole, Tommy Eppler, Albert Hada, Charles O’Donnell, Burton Maxwell, Ervin Abraham, Donald Baughman, Larry Bedwell, Rex Edger, Gary Kirtley, Ray Nissen and Wendel. White.